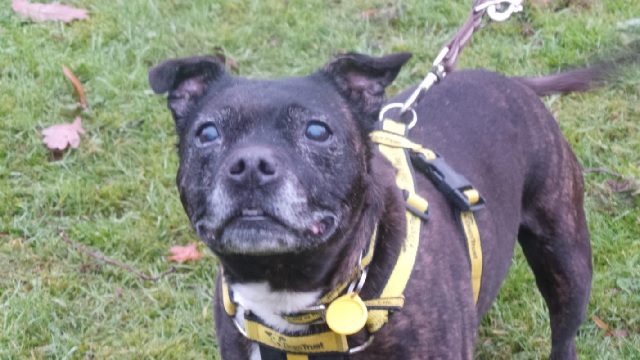 Little old Sally the staffy has won the hearts of all the staff at Dogs Trust Merseyside, especially her carer. Sally is currently in a foster home, so if you would like to offer her a forever home, you need to phone Dogs Trust first to make arrangements to meet her. Sally is such a sweet little thing and she loves to cuddle up and shower you with affection. She will make an ideal companion for someone who is home most of the day and is looking for a little chum. She can be nervous at first but she soon comes round when she knows that all is well. Previously, poor Sally was being left for the majority of the day by herself, and so now she craves company. She doesn’t enjoy being alone and would love to be someone’s sidekick. Sally is perfectly housetrained and can live with children aged 10 and over. She’s not so keen on cats and can be choosy about her doggy friends so would like to be your only pet. Sally is currently living in a foster home and is NOT at the centre. Please phone for more information and to arrange to meet gorgeous Sally. Please mention that you saw Sally on the Oldies Club website.